One day after falling to the Lions and locking up their first losing season since 2008, the Green Bay Packers will make several changes. 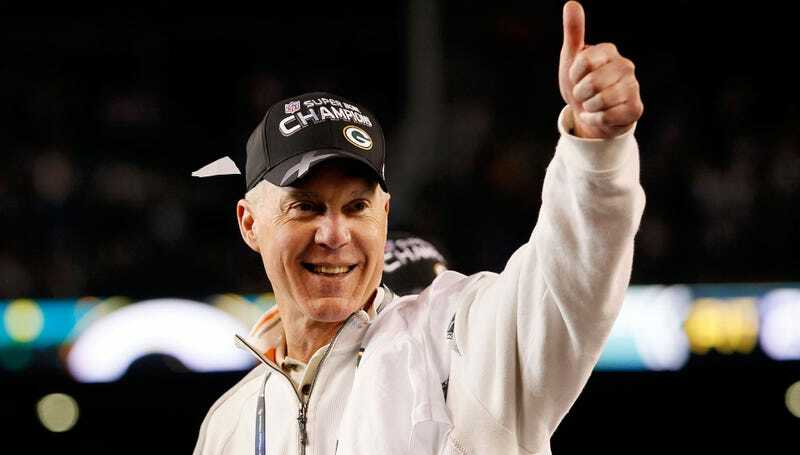 Ted Thompson has been with the team since 1992—save for a four-year spell in Seattle—and he served as the team’s general manager from 2005 until today, when he was reassigned within the organization, according to NFL Network’s Ian Rapoport. As is custom, the team will reportedly review several internal candidates. The Packers also fired defensive coordinator Dom Capers, per ESPN’s Rob Demovsky, as well as defensive line coach Mike Trgovac and inside linebackers coach Scott McCurley. Capers spent nine years running the Packers’ defense, though he hasn’t had a top-10 unit since 2010. His forthcoming firing seemed certain yesterday after head coach Mike McCarthy refused to talk about Capers’s future with the team shortly after letting the Lions score 35. Football Outsiders ranked Capers’s defense 24th this year. Green Bay will reportedly look to promote from within to replace him. With the Aaron Rodgers injury saga, a wearying lack of depth, and the spat between the team and tight end Martellus Bennett, this was an uncharacteristically tumultuous year for Green Bay. Rodgers is 34, and the 0-6 record the Packers had against this season’s playoff teams is a good argument for why the team needs to make the most of the offseason in 2018.